There’s a land outside the big city where pioneering folks are being drawn. A community of cleverly custom homes, neighborly togetherness, safe and easy living, yet—incredibly—offering everything you love about the city practically right outside your doorstep. We call it South Village of Nickel Plate. This legend in the making takes on mythical proportions when you consider the exceptionally prime location Gradison procured for development. We used our smarts and chose carefully—combined with some luck. 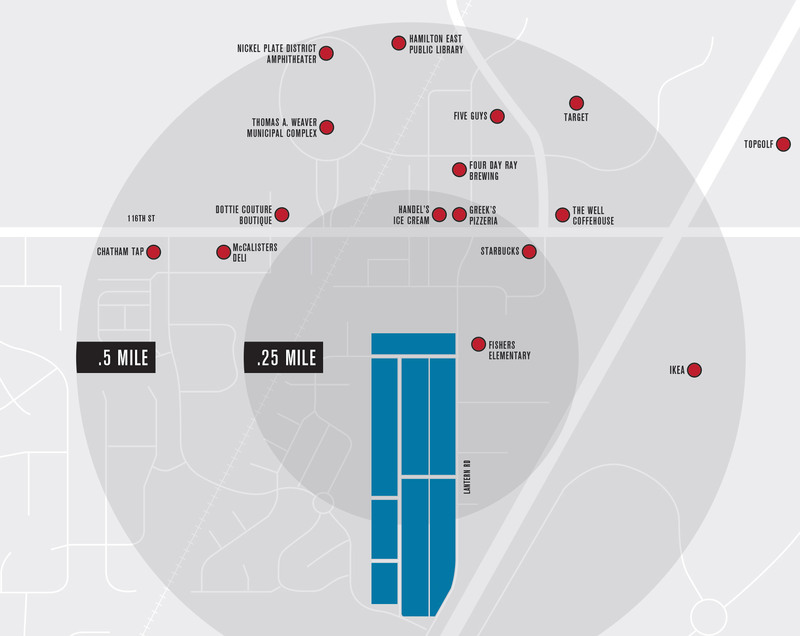 Tucked in-between Morgan Street to the west, and 116th Street to the north, the Village is cozied right up to what’s been called the number one place to live in America*—Fishers, Indiana—and its exciting, booming hub, the Nickel Plate District. There’s something we’re all longing for, that sense of belonging, of close-knit community, a slower pace—yet not wanting to miss out on any excitement. A friendly neighborhood place where family life, active leisure, vibrant culture and supporting local are all right there—without having to drive. That was the vision that sparked this suburban+urban dream. Just steps outside your edgy custom home in the Village, a simple walk, jog, bike or even skateboard ride away is the lively Nickle Plate District. Once here, you may never need to leave. Or want to. What’s happening here is extraordinary. The city has grown from a once sleepy community of 800 to a nearly 90,000-people hub of opportunity, transforming it into a destination to live, work, shop, dine and play, thanks to Mayor Scott Fadness and his vision to build a thriving tech hub committed to business growth. The “old town” district is positively alive in the most charming way, buzzing with independent boutiques, casual cafes to ethnic eateries, sweet shops, microbreweries and coffee shops that spill out onto the sidewalks during warmer months. Friends, families and business people share the space in a likeable mix of entrepreneurial energy and laid-back ease. Urban greenspots with benches, brickwork and bike racks fill in the spaces throughout the sunny (most days) skyscraperfree sidewalk town, giving folks interesting places to greet and gather. Beyond shopping and dining, the ample ways to enjoy life here include farmers markets, art crawls, street fairs and festivals like the Renaissance Fair and Fishers Freedom Festival, concerts at the community’s amphitheater, and popular crowd-pullers like the annual Mud Day event. Out here in the “surbs” of Fishers you will not struggle as you would in the city to find every amenity you need for the family. South Village is well-served locally by daycare centers, good schools, safe neighborhoods, playgrounds, gyms, grocery stores and family-oriented businesses of all types. The Nickel Plate Walking Bridge connects you to the District, and miles of nature trails get you anywhere else you want to go. In and around South Village are 591 acres of parks, 104 miles of nature and multiuse trails, and 61 sports fields to immerse yourself in the outdoors—yet in moments you can conveniently access public transportation and interstates. We intentionally chose an already great town on a clear growth track. Having that long-range vision is important when you’re talking about putting down stakes. Since its revitalization began, Fishers has achieved job growth of 11.6 percent. Among the District’s $90 million worth of redevelopment projects, which include mixed-use buildings for luxury apartments, retail, office space, medical and more, is the Mayor’s plans for an entrepreneurial center where independent professionals will converge. And for those longing for more independent eateries in the district—because let’s face it, you can never have too many restaurants—Fishers has plans to remedy that with the Yard, an upcoming $40 million development that will include up to 18 new restaurants, not to mention entertainment venues and a 3,000-square-foot culinary incubator enabling food entrepreneurs to launch new food concepts and experiments.